TOKYO, Nov, 23 2018 - (JCN Newswire) - ITU-T, which is a United Nations specialized agency, approved standards about soft errors(1) affecting telecommunication equipment on November 13, 2018. 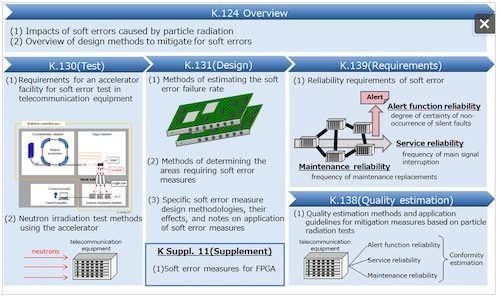 These standards stipulate the design, testing and quality estimation methods and reliability requirements concerning measures designed to mitigate malfunctions (soft errors) in telecommunication equipment on the ground chiefly caused by cosmic rays. To develop these standards, NTT, Fujitsu, Hitachi, NEC, and Oki jointly developed draft Recommendations at "the Ad Hoc Committee on Soft Error Testing (SOET_Adhoc)" formed by TTC, and have driven efforts at ITU-T SG5(2) meetings, with the cooperation of Orange, to have these drafts adopted by ITU-T. Recently, however, it has become possible to measure the influence of soft errors on telecommunication equipment using a compact accelerator-driven neutron source(3). This measurement makes it possible to determine the influence of soft errors and take preventive measures in advance before vendors sell products and telecommunication carriers introduce telecommunication equipment into operating networks. While it has become possible for carriers to improve network quality dramatically by mitigating soft errors at the stages of equipment development and introduction, there is a need for requirements that serve as the benchmark for methods and evaluation of countermeasure. Unlike a hard error, which is a fault that causes permanent malfunctioning of a semiconductor device, a soft error is a temporary error that disappears as soon as the semiconductor device concerned is restarted or the data concerned are overwritten. ITU-T(International Telecommunication Union - Telecommunication Standardization Sector) is an ITU organization that issues Recommendations with a view to standardizing telecommunications. Study Group 5 (SG5) investigates issues related to the environment and climate change. A facility for producing neutrons through a nuclear reaction caused by irradiating the target with protons or electrons that are sped up by an accelerator. Impact of particle radiation (emitted energy in the form of neutrons, alpha particles, etc.) on semiconductors. 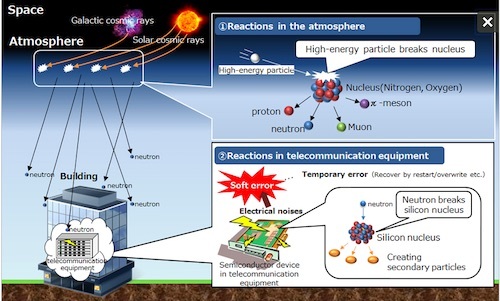 In recent years, the number of soft errors in semiconductors caused by neutrons generated in the atmosphere by cosmic rays has been increasing on the ground.